I'm wondering how many of you make New Year's Resolutions? Perhaps you don't call them that, because, after all, who can keep a NYR anyway! Perhaps you make goals for the new year or refuse to do anything at all! Whatever the case, it got me thinking about various resources for the "standard" resolutions that so many of us make every January. Here's a short list - leave a comment here or on our Facebook page with your own resource suggestions! www.YouVersion.com has multiple Bible reading plans you can choose from and a smartphone app so you can access it via your phone or computer. Commit to reading your Bible MORE this year! First MB Women's Bible Studies: Sign-ups for three studies begin THIS SUNDAY! (1/8 & 1/15). Walk Through the Bible - 1st/3rd Wednesdays 10-11:30am, childcare available. Join Dr. Oz's new Transformation Nation and start taking steps towards a healthier you! 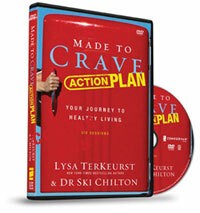 Made to Crave by Lysa TerKeurst. She now has a devotional & study guide to go along with her book that came out last year. A healthy you (physically) begins with spiritual health. www.mint.com is a free online budget service. You link all your accounts into the website and assign budget amounts to your categories. Then as you make transactions, it automatically pulls the information into your budget. Can pay bills, start savings plans and other things as well. Saving Savvy by Kelly Hancock (www.Faithfulprovisions.com). A book all about meal planning, freezer meals and ways to save on your grocery bill. Get organized and get shopping. Starting January 9th, Glynnis will be featuring a 15-Day Clutter-FREE Challenge on her blog. She’ll be addressing ways to reduce the clutter in our minds, schedules, offices and homes. If you’d like to join her, visit her blog today for more information.